Planting sweet potatoes too early can result in frost-bitten or damaged plants. When the soil is warm, around 70 to 80 degrees, and the last danger of frost is past, it's time for planting. 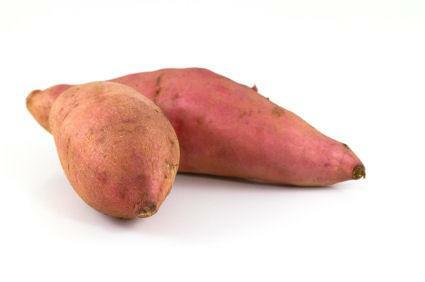 Sweet potatoes are native to Central and South America. While there are many varieties available for the home garden, all require approximately 100 or more growing days to mature. This means that sweet potatoes generally thrive in the warmer southern climates of gardening zones 9, 8, 7 and possibly 6 as well. For more northern zones, check with your local County Cooperative Extension Office for specific varieties that will thrive in your area. Purchase sweet potato slips, or starter plants, from a garden center or mail order catalog. It's important to buy slips or starter roots from a reputable source to ensure disease-free plants. Sweet potatoes need a large amount of room. They grow in vines, spreading out with tendrils that root through nodes. They need full sunlight, defined as six or more hours of sunshine per day, and the more light the better. After planting sweet potatoes, you'll need to keep the area well watered. Locating the garden bed near a hose or sprinkler makes watering more convenient. Sweet potatoes prefer rich, loamy soil, so work in compost or well-rotted manure at least two weeks prior to planting. Soil pH should be around 5.6 to 6.5 or slightly acidic. Sweet potatoes are more susceptible to diseases if planting in neutral or alkaline soils, so test pH and amend as needed to get the soil a little on the acidic side. One of the unique aspects of planting sweet potatoes is the creation of ridges in the garden bed. Sweet potato slips or roots are set in the ridges. To create a ridge, pile the soil up in long rows. Leave three feet between the rows so you can walk among them easily. Sweet potato slips must be planted at a depth of about six inches, so keep the top of the ridge high enough to accommodate the slips. Plant sweet potatoes when the days are consistently warm and the night temperature doesn't fall below 60 degrees. If it's a cool spring, you can place black plastic over the garden bed to raise the soil temperature. Plant slips about six inches deep in the tops of the ridges, leaving 9 to 12 inches between them. If there's a little leaf or two showing on the slips, let that remain above the ground level. Gently pat the soil around the slips and give them a good drink of water once they're planted. After planting the slips, water them daily but don't drown them. Too much water or water logged soils cause the slips to rot. They do need moisture, however, in order to start to grow. You'll begin to see leaves and shoots appear from the slips. These reach out and root time and time again through vines. Bush varieties won't spread out as far, but all will spread out somewhat. Some will spread up to 20 feet from where you planted the original slips! Sweet potatoes use a lot of nutrients from the soil. Consider using a 5-5-10 fertilizer on the sweet potatoes during the growing season. Apply according to package directions. Sweet potatoes aren't harvested until the fall, typically after the first frost in the fall. They will need to be dug up carefully from the soil, with the tubers left to dry in the sun for several hours. This is called curing. After curing for a day in the sun, they're cut off the vines and left to cure for 10 to 14 days in warm conditions, then stored in cool conditions until ready for use. Illinois Cooperative Extension fact sheet on growing sweet potatoes. Tips on growing great sweet potatoes, including more information on planting them, is on Gardens.org. The DIY Network also offers step by step instructions on growing great sweet potatoes. Whether you're growing sweet potatoes as a fun project or hoping to grow enough to feed your family throughout the winter, once they're established they're easy to grow. Come fall, you'll have a delicious crop of orange beauties to delight your taste buds.